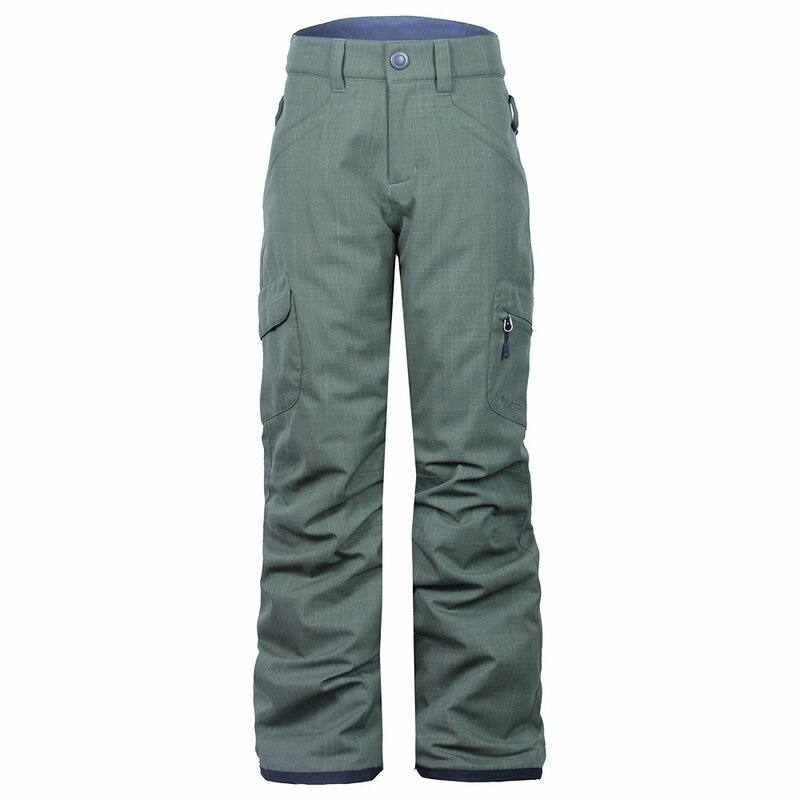 A quality ski pant with great fabrics and features, the Boulder Gear Ravish Ski Pant is a great value for girls. The Ravish has a 10K waterproof rating, 80g of insulation, zippered leg vents in case she gets too hot, and lots of pockets so she can carry her own stuff. This kids' pant also has the Grow Feature, which allows the legs to be extended an additional 1 ½”. This means you’ll get more than one season out of these great pants. "My daughter wears a size 10 and is very thin. What size does the small, medium, and large fit. I didn't see a size chart." "Size small is a 8/9, medium is a 10/11, large is a 12/13, and xl is a 14/15." ""I need this for a person with pants size: waist 33/34 and Inseam: 28"/29" what would be the correct size to order please? "" "Kids pants only go up to a waist of 29.5". You would need to look into a short length men's pant for a waist of 33-34. You can view all of our short inseam pants here." "I recently ordered the girls Obermeyer Kensington ski jacket in black. Would either Boulder brand black ski pant match this jacket we purchased?" "Yes the Obermeyer Kensington jacket would most likely match the Boulder pants." "My daughter is also very slim. Are these a good choice for her? " "These pants are more of a relaxed fit. Given that you are looking for black pants, we would recommend the Obermeyer Brooke Ski Pant, or the Obermeyer Jolie Softshell Ski Pant." "How about an XS in this? I have a husky 4-yo." "An XS might work for your 4 year old, as this is a relaxed fit pant! You may also want to refer to the Boulder Gear Sizing Chart to correlate her measurements with the sizing chart!" "Does it have an adjustable waist? XXl...is that a 16/18? Daughter is 5"4 will this be long enough?" "Yes, XXL is going to be like a 16-18. This pant does have an internal adjustable waistband. The inseam is going to be approx 31"." "I'm 5'3" 120lbs and 26" pant size. Which kid size is the best fit?" "According to the size chart, you may need a size large. Please check out the size chart to see all measurements and to see which size would be best." "my daughter is 9 years old very tall 4'11 waht size would be best for her xl? " "It looks like a size large may fit her but it's best that you refer to the size chart to check out the other measurements (waist, hip, etc) to see if that is the correct size for her. " "what the difference of XL vs XXL for kids "
"Thank you for your inquiry. Based on physical measurements taking by one of our sales reps, the 2XL is as follows. Waist: 32-34 Hip 40-44 Inseam 29 1/2 inches. We hope this information helps." "My 12 year old daughter is 5'2 and 86 lbs. What size do you think would work best in this pant? " "Thank you for your inquiry. Unfortunately, we cannot provide you with sizing related answers based on your height, weight and age. To ensure an accurate size, we need you to provide us with your correct measurements. Here is the link to the size chart If you need further assistance please contact us at 800-818-0946. " My daughter is slim and tall. I ordered 5-6 pairs of ski pants for her, and these were the only ones long enough in her size. Great detail on the white ones is the black banding at the bottom, so the hem doesn't get filthy. She says they're warm and comfortable, with plenty of room for even a thick layer. These Boulder Gear pants do not fit my daughter, who is slim. The pants are so wide that she looks like wearing two huge bags. I returned it and bought Kiltec pink pants, they are gorgeous, the color and quality are better. Even though it says slim fit, my daughter is able to put in her baggie sweatpants inside it comfortably, just wanted to help out those trying to find the right fit.